WATERLOO, Iowa—The National Wrestling Hall of Fame Dan Gable Museum has released a limited edition singlet to commemorate the legacy of Dan Gable. Gable won the 1972 Munich Olympics without surrendering a point and coached the Hawkeyes to 15 NCAA team titles in 21 seasons of coaching (1977-1997). This is the third in a series of limited edition singlets. The singlet was created and designed by Cliff Keen Athletic. The front of each singlet features Dan Gable as an athlete while training for the 1972 Olympics. The back of the singlet features the National Wrestling Hall of Fame Dan Gable Museum logo. Only 100 singlets will be sold. 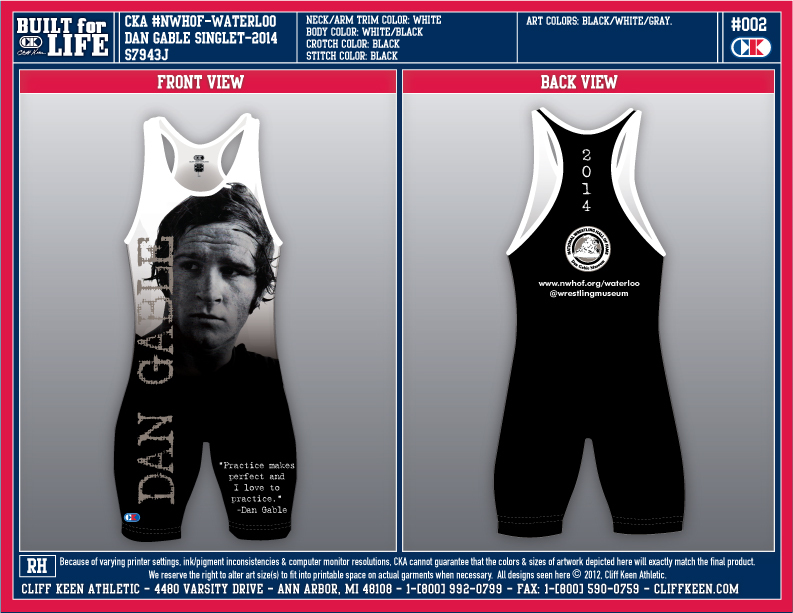 Each singlet will be signed and numbered by Dan Gable. The cost is $200 for each singlet. All proceeds benefit the National Wrestling Hall of Fame Dan Gable Museum, a not-for-profit organization based in Waterloo, Iowa. Anyone interested in pre-ordering a singlet should contact the National Wrestling Hall of Fame Dan Gable Museum at [email protected] or (319) 233-0745. All sizes are available. The National Wrestling Hall of Fame Dan Gable Museum announced Wednesday that Iowa governor Terry Branstad will declare Thursday, Oct. 25, 2012 Dan Gable Day across the entire state. A special presentation will be made at the NWHFDGM in Waterloo, where Gable was a three-time state champion at Waterloo West. Almost everyone knows Gable's resume, including two-time NCAA champion and three-time national finalist at Iowa State and the 1972 Olympic gold medalist, at Munich, Germany. His Olympic title was highlighted by the fact he didn't allow a single point in competition. Gable coached the University of Iowa from 1977-1997, guiding the Hawkeyes to 15 NCAA team titles and 21 Big Ten championships. Gable was honored in April with, a bronze statue outside of Carver-Hawkeye Arena. WATERLOO"Iowa's greatest sports figure and Iowa's longest serving governor will be the focal point of a special presentation in Waterloo. Iowa governor Terry Branstad will declare October 25, 2012, as Dan Gable Day statewide with a special proclamation to be read at the National Wrestling Hall of Fame Dan Gable Museum. Gable was born in Waterloo, Iowa, on October 25, 1948. He turns 64 on the day of the presentation. Gable won three individual state wrestling titles at West Waterloo (1964-1966) and compiled a 64-0 career high school record. He went on to win two individual NCAA titles at Iowa State University with a career college record of 117-1. Gable won an Olympic gold medal at the 1972 Munich Olympics without surrendering a point. Gable went on to lead the University of Iowa to 15 NCAA championships and 21 consecutive Big 10 titles in 21 seasons (1977-1997) during his tenure as head wrestling coach. In 2000, Sports Illustrated named him the top sports in the state. 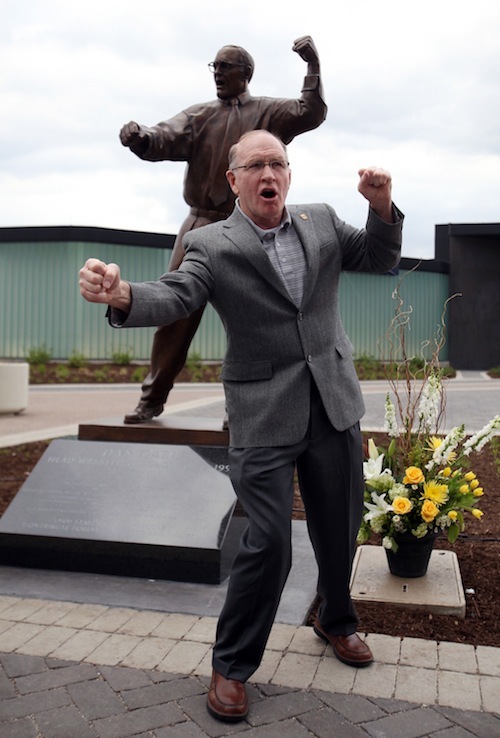 There are three statues throughout the state dedicated to Dan Gable's legacy. The event begins at 9 a.m. with a reception at the National Wrestling Hall of Fame Dan Gable Museum. A short program will begin at 10 a.m. with comments from Governor Branstad and Dan Gable. The proclamation declaring October 25, 2012, as Dan Gable Day will be read aloud by Governor Branstad. The National Wrestling Hall of Fame Dan Gable Museum is located at 303 Jefferson St. in Waterloo. Contact the museum at (319)233-0745 or [email protected] with questions about the event. This event is free and open to the public. CHARLES CITY " The Floyd County Community Foundation is hosting an evening of powerful stories about Iowans on Oct. 18. These stories will be presented by inspirational speaker Mike Chapman at the Knights of Columbus Hall, 502 Clark St. This event is free and open to the public. The evening will begin with a social hour at 5 p.m., followed by Chapman's presentation at 6 p.m.
Chapman, a native of Waterloo, is the publisher of the Iowa History Journal. He had a 35-year newspaper career from which he retired in 2002, and in 2009 he retired from an 11-year career serving as the executive director of the Dan Gable International Wrestling Institute and Museum. Chapman has written 23 books, 14 of them on wrestling, and his articles have appeared in dozens of national and regional magazines. As a reporter, he has attended 43 NCAA wrestling tournaments, two Olympics and two World Championships. He has won numerous awards for journalism and writing and has been named National Wrestling Writer of the Year five times by four different amateur wrestling organizations. Chapman is also the founder of WIN Magazine, one of the nation's top amateur wrestling publications; the WIN Memorabilia Show, which draws 8,000 fans each year to the NCAA Championships, and the Dan Hodge Trophy, which goes each year to the top college wrestler in the United States. He has interviewed, Ronald Reagan, Muhammad Ali, Robert Redford, Lou Ferrigno and many others. Chapman has appeared on numerous TV shows - including the networks ESPN, A&E, Fox Sports and Iowa Public Television. He has been the guest on over 200 radio talk shows. The Olympics are full of great, athletes, who train hard, win big, and represent the USA with their, sportsmanship. Heres to the ones that never give up. CORALVILLE "Dan Gable thought it was just an elaborate retirement party. He was unaware that by the end of the festivities he would learn that he would be immortalized in front of the very arena that he turned into a Mecca for amateur wrestling. Gable mouthed the word "Wow" and his fingers slightly rubbed his chin as University of Iowa Athletics Director Gary Barta announced to a crowd of nearly 1,000 people at the Marriott Hotel and Convention Center on Saturday that a seven-foot statue would be erected in front of Carver-Hawkeye Arena in time for the 2012 United States Olympic Team Wrestling Trials on April 21-22. He wasn't expecting that to be part of his retirement bash. Gable said he had endured an emotional few days, leading up to the event. He might have been tapped out by Saturday night's presentation. It came at the end of a ceremony that contained a number of speakers share stories of his career and what they experienced as the cornerstones of his legacy. Gable said it was unique and interesting to observe. The night included a highlight video and a taped message from some grandchildren, who said their grandfather likes to drink Mountain Dew and even eat chocolate doughnuts. Humorous anecdotes were balanced with heart-felt admiration. Tom and Terry Brands, who are the current head wrestling coach and associate head coach for the Hawkeyes, talked about his influence and his unyielding standard for excellence. Ben Peterson, a former Iowa State and Olympic teammate, and others talked about how he balanced being focused on wrestling with an even stronger devotion to his family. Minnesota head coach J Robinson, one of six current Big Ten coaches who for or by Gable, described him as being a flexible coach, a relentless competitor and a focused opponent. They owned different relationships with Gable over the years and had their unique views, but there were consistent themes with every person who spoke. He was focused, dedicated and driven to be the best on and off the wrestling mat. He said he was interested in the gracious comments from Robinson, who was an assistant to Gable from 1976-84. Gable said he had never experienced that side of Robinson, who spoke for more than 23 minutes. He zinged the rest of the group for not sharing these things previously. "I just didn't think they were all as smart as they were," Gable said. "That's what really hit me most. Gable was an undefeated three-time state champion at Waterloo West for legendary coach Bob Siddens, who attended the banquet. He was a two-time NCAA champion and three-time finalist for the Cyclones, posting a 182-1 record in high school and college. Gable, a six-time Midlands champion, went on to become a World and Olympic champion, capturing the gold medal in the 1972 Olympic Games in Munich without surrendering a single point. Gable is Iowa's all-time winningest coach, posting a 355-21-5 dual record from 1976-97, including a 95-1 mark in CHA. He coached 10 Olympic wrestlers "four gold medalists "and 45 NCAA champions, including 152 All-Americans while winning 15 NCAA team titles highlight by a streak of nine straight. He guided 106 Big Ten Champions as the Hawkeyes won 21 Big Ten team titles. It was hard for him to identify a signature era during his tenure. Gable said it was hard to differentiate between the decades, but said the late 1980"²s when the string of national titles was snapped was a key time for him as coach. "I really think I made some major changes in my life that affected my life in an unbelievable positive manner from a coaching and a family point of view," Gable said. Gable has a couple statues honoring him already, and commented that he didn't have any input on those and that he doesn't really recognize himself in those tributes. This one came as a complete surprise. He thought it would happen some day but not until he was done building his legacy. It's time to come clean. I've lied in this blog for two and a half years. I've always claimed that I never wrestled and that isn't entirely true. I did win an 8th grade intramural championship at Frank L. Smart Junior High School. In 1963 every boy in Davenport, IA (it was a sexist world) was introduced to wrestling in some way. There were instructional units in our PE classes where we were taught the basics of the single leg takedown, the sitout and the half nelson. At the end of the unit the teacher would organize an intramural tournament and we were encouraged to enter. At about the same time that I reached the apex of my wrestling glory, 130 miles to the northwest, in Waterloo, a kid named Gable was launching his career. It's a story of 2 choices. I opted for being a really bad basketball player and he chose to become one of America's greatest wrestlers. A few years later, in Del City, OK, some brothers named Smith were exposed to wrestling and chose to pursue their dreams "with John going on to win two Olympic Gold medals and four World Championships. Long before I, or Dan Gable or the Smiths were born a kid named Norman Borlaug stepped on the mat in Cresco, IA. After his wrestling career at the University of Minnesota, he, too, made a choice "to go an to graduate school and earn a masters degree and PHD in plant pathology. His lifetime of food production research saved millions of people around the world from starvation and in 1970 he was awarded the Nobel Peace Prize. So " what's the one common thread running threw Dr. Borlaug, Dan Gable, John Smith and me? We were all exposed to wrestling at an early age. We may have all taken divergent paths "but we all had the opportunity to learn the values of wrestling. I'm not sure that enough of today's youth gets that opportunity. What's the answer? I don't know "but here's what I'm trying. I must begin by saying that I love NCAA Division III wrestling. Those guys really "get after it". I've attended a few NCAA Division III Championships and the Saturday morning session might be my favorite part of that event. Everyone wrestling then is already an All-American and is battling to determine his spot on the podium. I'll see more throws, reversals to pins "in general more excitement "in that one session than I might see in a whole season of Hawkeye dual meets. I know that the skill levels are different "but boy do I love watching DIII wrestlers. What if kids who are new to wrestling got to see all of that fun and action? Would a few of them step on the mat for the first time? Would some of them get motivated enough to stick with the sport when it gets tough? I don't know "but I'm hoping to find out. I'm raising enough money ($10,000) to buy 1,000 tickets to the Saturday, March 6, 2010 morning session of the NCAA Division III Wrestling Championships at the US Cellular Center in Cedar Rapids, IA and giving them away to kids. The tickets will go to a variety of kids. Many will be reserved for students at flood impacted elementary and middle schools in Cedar Rapids. Local youth organizations like Boys and Girls Clubs will also get some. Most will probably go to youth wrestling clubs. There is no geographical preference for the wrestling clubs " if you want to bring a group to Cedar Rapids, just let me know. So far, support has been encouraging. Corporate pledges have reached over $4,000, including an extremely generous gift of $2,000 from the Cedar Rapids Marriott. When wrestling writer KJ Pilcher published an article about the project in the Cedar Rapids Gazette just before Christmas, I got another $600 in pledges in three days. Cornell College has allowed me to raise money on-site at wrestling events. To date a total of about $5,600 has come in. Some folks have suggested that I should be happy with what has already been accomplished. That's like suggesting that Gable should have been satisfied with two NCAA titles after the loss to Owings or telling John Smith that a couple of international championships are enough for any man. I won't stop until we get 1,000 kids in that arena "and I may not stop then. So, dear readers, I am asking you to help. Several of you already have and to those I offer my heartfelt thanks. But "there's still work to be done. Will you who haven't yet contributed join this elite group of fans? Your donation may just be the one that puts the next Gable or Smith or Borlaug on the mat. PS If you have a group of kids that would like tickets, please email me. It is often said that one of the best bases to have as a mixed martial artist is wresting. Wrestling, in all of its forms, is a sport that is all about leverage and control. Many fighters who have come from a strong wrestling background have found great success. Just look across the MMA landscape today as it is littered with champion wrestlers making the transition to the sport. The reason wrestlers have excelled in MMA is not due solely to wrestling itself. Wrestlers are successful because of the drive, determination, and work ethic that they bring with them. If there is one man who epitomizes wrestling, drive, determination, and work ethic, it is Dan Gable. After an undefeated prep wrestling career, the three-time Iowa state wrestling champion chose to attend Iowa State University. While at Iowa State, Gable continued his winning ways by capturing three Big Eight Championships, earning All-American honors all three years. The only defeat that Gable suffered during his collegiate career came at the hands of Larry Owings. That loss came during the NCAA finals his senior year. That loss helped to fuel a fire inside Gable, a fire that would lead him to greatness. While attending college and after his collegiate career Gable competed in Olympic freestyle wrestling. Gable was a six-time midlands champion and a three-time USA Freestyle National Champion. In 1971 Gable became World Champion, winning the 68kg division in Sofia, Bulgaria. In 1972, when the Olympics invaded Munich, the goal was simple; bring home the gold. During these historic Olympics Gable would not only win the gold but he did so without surrendering a single point to his opposition. In Gable's final 21 Olympic qualification and Olympic matches, he scored 12 falls and outscored his nine other opponents, 130-1; the lone point being scored by Larry Owings. It is not difficult to imagine that had MMA been an avenue available to the Olympic champion, it would have been something to consider. For many college wrestlers MMA has become the most suitable path to follow the dream of professional athletics. Gable could have been a force inside the octagon, and would have likely competed at lightweight. The lightweight division has truly become a fan favorite, due to the incredible pace at which the athletes fight. Gable would have surely been at home in that atmosphere. With an unstoppable shot and flawless transitions, Dan Gable would have ruled the lightweight land. The ability that he possessed to throw and control another human was unreal. We will never know if Gable could learn to strike, or if he could even take a punch, but we do know that he could wrestle. With his caliber of wrestling, and his work ethic, he would have become a champion. The National Wrestling Coaches Association is pleased to announce their 2009 Annual Convention, to be held at the Bahia Mar Hotel in Fort Lauderdale, Florida on August 6-9th. This year's convention features many informative sessions that will be beneficial to both the scholastic and collegiate coaching communities. The NWCA Convention is the time for coaches to interact with one another outside of the wrestling season, paired with informational sessions on how to take a more proactive approach to being the coach and "CEO "of your team. This year's focus for the collegiate divisions is, "To Protect and Promote Your College Program. " Scholastic Coaches will focus on: Leadership, coaching development, technique and networking. "¢ Division I "Mock NCAA Selection Process"
Highlighting the event will be legendary Coach Dan Gable as this year's guest speaker for the NWCA Conventions opening luncheon on Friday, August 7th. Coach Gable is the University of Iowa's all-time winningest wrestling coach from 1977-1997. His career coaching record totals 355-21-5, leading the Hawkeyes to 15 NCAA Team Championships including nine consecutive championships (1978-1986). In the 1972 Olympic Games in Munich, Germany, he won a gold medal without surrendering a point to any of his opponents. He has been appointed to the President's Council on Physical Fitness and Sports. Gable has also been named the top wrestler of the 20th century by Gannett News Service. He was listed as one of the top coaches in the 20th century by ESPN. Along with being named Iowa's top "sports figure "in the past 100 years. The convention luncheon featuring Coach Gable will take place August 7, 2009, at noon in the Grandview Ballroom of the Bahia Mar Hotel. Extra tickets for the luncheon can be purchased by calling the NWCA Office. Also addressing the convention attendees will be Dan Gould the Director of the Institute for the Study of Youth Sports and a Professor in the Department of Kinesiology at the Michigan State University. Gould is a professor with a specialty in applied sport psychology. He has co-authored two books, Foundations of Sport and Exercise Psychology (with Bob Weinberg) and Understanding Psychological Preparation for Sport: Theory and Practice of Elite Performers (with Lew Hardy and Graham Jones). Gould partnered with the NWCA in 2008 to aid in the development of the Coaching Education Programs and the NWCA Leadership Academy that is being unveiled prior to the convention. The featured clinicians are Tom Borrelli of Central Michigan University and Brian Smith of the University of Missouri, both coaches who have produced many talented college wrestlers along with promoting their teams to the community. Coach Borrelli has been the head coach at Central Michigan for 17 years. In that time he has also been named the NWCA Bobb Bubb Coaching Excellence Award Winner and the NWCA and WIN Magazine National Coach of the Year. Coach Smith has been with the Missouri Tigers for the past 10 years. Smith has local roots growing up in Fort Lauderdale and starting his coaching career at Western High School. Smith has also been honored as an NWCA National Coach of the Year. There will be an additional technique session specifically for the scholastic coaches hosted by Dave Crowell, Head Coach at Nazareth High School (Pennsylvania). Crowell has been honored five times as the Pennsylvania State Coach of the Year and has also been named an NWCA National Coach of the Year. Space is still available for coaches wishing to attend, registration can be completed online. The full convention registration is $225; there is a $50 discount for multiple coaches from the same school with the purchase of one full registration. For more information on the NWCA Convention you can contact the NWCA Office at 717-653-8009 or by going to our website at www.nwcaonline.com.